A 14-year-old in Dallas, Texas has been arrested for bringing a clock to his school. [Ahmed Mohamed] could be any one of us. He’s a tinkerer, pulling apart scrap appliances and building projects from the parts. He was a member of the his middle school robotics team. The clock was built from a standard four digit seven segment display and a circuit board. [Ahmed] built the circuit inside a Vaultz hard pencil case like this one. He then did what every other experimenter, inventor, hacker, or maker before him has done: He showed off his creation. Unfortunately for [Ahmed] one of his teachers immediately leapt to the conclusion that this electronic project was a “hoax bomb” of some sort. The police were called, [Ahmed] was pulled out of class and arrested. He was then brought to a detention center where he and his possessions were searched. [Ahmed] is now serving a three-day suspension from school. His clock is considered evidence to be used in a possible criminal case against him. The teenage geek with the ham radio license in me who built this sort of thing for fun and amusement and who went on to become an engineer and build more fun stuff is particularly miffed at that. So, yes. #IStandWithAhmed. I also stand with the kids for whom Ahmed is a signifier. He's the one we've heard about. There are others. I believe today should be National Bring a Clock to School Day. In July, UI digital project librarian Laura Hampton officially began the long process of archiving the Hevelin Collection. 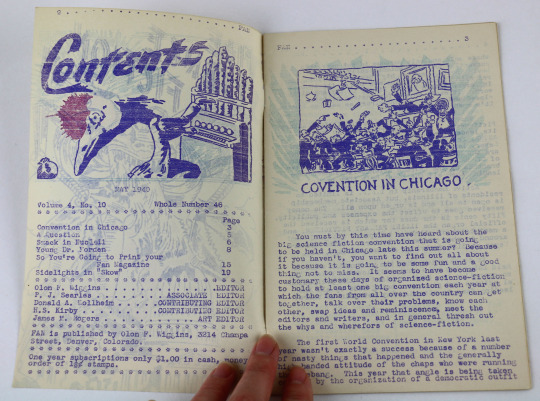 The library is partnering with the fan-run Organization for Transformative Works to collect more zines for eventual digital archival, but Hampton is currently focused on material from the 1930s to 1950s, spanning the rise of zines and the Golden Age of science fiction. The vast majority of the images will stay offline, but an accompanying Tumblr has given outsiders a peek into the roughly 10,000 zines that Hevelin donated — and into the communities that helped create science fiction as we know it, from fandom clashes to fan fiction. 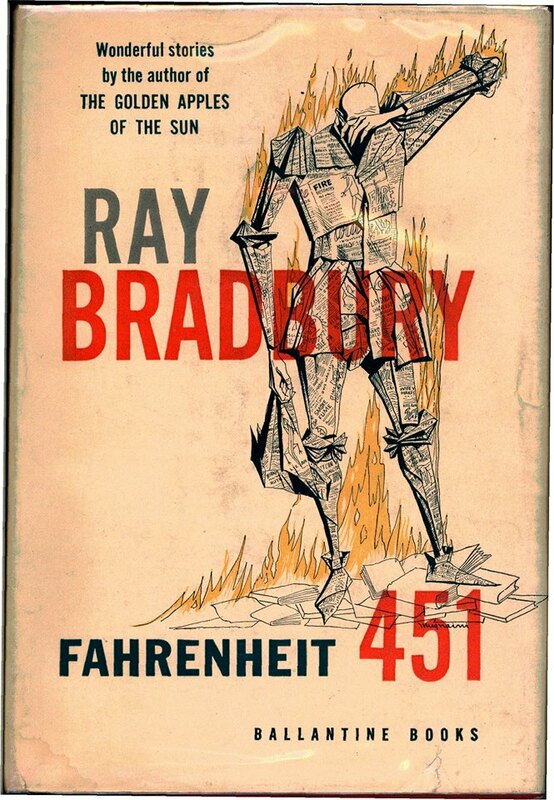 (2) Pop quiz at Clickhole – “Obama Quote Or Description Of A Ray Bradbury Book Cover?” Unlike quizzes at File 770, not all the answers are Ray Bradbury. (4) Rachael Acks, on “FAQ: What is SFWA in charge of? 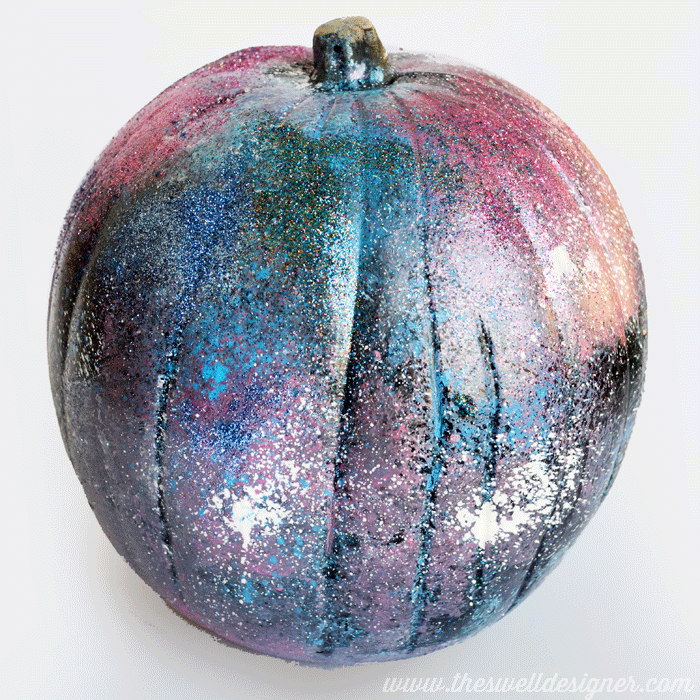 ***” , lists six things SFWA is in charge of and 35 it is not in charge of. How does she keep track? I suspect that the chance of these changes being enacted are remote (every existing Hugo category has an entrenched constituency, so while adding categories is difficult, abolishing one is all but impossible) but nonetheless, I think these are eminently sensible changes and I would whole-heartedly support them. Let me tell you why. For me, the most problematic Hugo categories are those that honor a person rather than a work. Look at Best Artist, for instant. I was just discussing that with my friend John Picacio this past weekend, as it’s a pet peeve of his. The award has been around for half a century, yet fewer than twenty people have ever won it. The same people win, year after year. Many voters have no idea what art they did the past year, if any; they just know, “oh, I like X’s art,” and they vote for him, again. The Best Editor categories have shown every signs of working the same way. Originally the category WAS Best Magazine, which was easy to judge. Did ASTOUNDING or GALAXY have a better year? It was changed to Best Editor in the 70s, during the boom in original anthologies, sometimes called “book-a-zines”… and to allow book editors to compete. But few book editors were ever nominated, and none ever won, until the category was split in half. Problem is, and this complaint came up often during Puppygate and after, that most books do not credit their editors… and besides that, the reader has no real way to know what the editor did. Some novels are heavily edited, some much less. What is the criterion? The proof should be in the pudding. Which pudding tastes better. Reward the WORK, not the author or editor or artist. Go back to Best Magazine, and add Anthology/ Collection (both the Locus Awards and the World Fantasy Awards have such a category, and it works well). That more than covers the Short Form Editors. In his novel, many people earn a small income through informal part-time work with affiliate networks, doing random work. Today you can earn a small income through Amazon’s Mechanical Turk and there are many Uber-like services whereas individuals can earn small sums by doing various services. So this prediction is almost certainly coming true…. Christopher Priest leaps to the defense of Terry Pratchett. I remember years ago reading an article in Time Out from a woman who had been assigned to write about Pratchett and proceeded to state that she had not read any so she just asked her male friends if it was just boy’s stuff and they said that it was, thus proving they hadn’t read it, either. She rattled on for several more paragraphs but… seriously? That’s how a “professional journalist” covers an assignment? So now we have some nitwit over on the Guardian‘s blog pontificating on the lack of quality of Pratchett’s work which he says he hasn’t got time to waste actually reading it. I don’t know where these people come from. In a situation like this, leaving often seems like the best option. Certainly, Bee has cut back on her involvement with the SF/F community at large. But she’s determined to keep on doing what she loves and is passionate about. “I plan to keep writing,” she says. “I don’t think of SF/F as a community any more so much as a subculture that shares an interest or hobby rather than a sense of community. (9) William Underhill in a comment on Mad Genius Club. I also think the fact that File770’s posts are moderated and need to be approved, and posts here and on Mr. Torgersen’s blog are not, is thought-provoking. I have long felt that there’s a real need for spaces where people can get together and passionately discuss the short fiction they read. That having such a space would make it easier for readers to find more short stories they’ll like. A place where anyone can rate and review stories and also easily find write-ups by pro reviewers. A Goodreads-type site for short fiction. And before you ask: no, Goodreads itself wouldn’t be a great space for this. The company isn’t interested in adding individual short stories, and the few that are on there now are either shorts that were issued with ISBN numbers or put there by community librarians. We need a site and service that is committed to creating a database of short fiction, with the ability for signed-in users to rate and/or review that also pulls in links or review text from pro reviewers where they exist. Having such a site could also make it easier for people to nominate for the Hugo Awards when that time comes around. As everybody knows, you don’t need to have read everything in order to nominate faithfully and well. You only have to nominate the best of what you’ve read. However, if you want to see what other folks have read and loved, you could just go to the list of short fiction published during the year, sort by highest rating, and read the top 10 or 15 or 20. I would love to spearhead such a project. But: money. Anyone know a venture capitalist? (11) Hey, I just came across this photo today. If you open the picture in large format, you can see John Scalzi is wearing the yellow “File 770, That Wretched Hive of Scum & Villainy” button he pinned on his lanyard just before the panel began. Best President in Case of Alien Attack? Take a presidential election year, stir it together with the debut of National Geographic Channel’s Chasing UFOs series and — voilá! — you get a press release declaring that more people think Obama is better suited to handle an alien invasion than Romney. I’m used to hearing that elections will be swung by the undecided. Now it seems the unidentified will play a role too. Two-thirds (65%) of Americans prefer Barack Obama over fellow presidential candidate Mitt Romney when it comes to handling an alien invasion. Obama has a commanding lead no matter how you slice it – among women, men, the elderly and citizens aged 18 to 64. So do these responses, taken together, mean that most people believe an alien invasion will be a social occasion calling for a terrific speech? Furthermore, if aliens attacked our planet, more than one in five (21%) would most likely call on the Hulk to deal with the havoc. Far fewer would most trust Batman (12%) or Spiderman (8%) to step in. President Obama, who collected Spider-Man comics as a child, paraphrased Stan Lee’s famous line from Spider-Man’s origin, “With great power comes great responsibility” during a February 14 photo-op with the Chinese Vice-President. Credit David Klaus for catching the reference. Obama revealed his fascination with Spider-Man in 2008 campaign speeches. Marvel reciprocated with an issue of the comic where the President’s favorite superhero keeps The Chameleon from spoiling the inauguration. 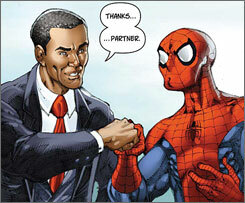 There was even a fist-bump between Spidey and the new president. “They’re taking this more seriously than they are petitions for legalization of medical cannabis with far more signatures,” says David Klaus. What the White House has chosen to answer instead are two petitions asking the U.S. government to admit that aliens have visited earth and to disclose any intentional withholding of government interaction with extraterrestrials. An Obama administration initiative called “We the People” initially promised a White House response about any issue that received at least 5,000 online signatures within 30 days. The petition about alien visitors was signed by 5,387 people, and the one about disclosing government interaction with E.T.’s by 12,078 people. This must have been a little bit more democracy than they were prepared to handle because the requirement now has been raised to 25,000 signatures. Posted in Heard Online	| Tagged Barack Obama, E.T. The Lincoln Medal was presented to George Lucas during the rededication of Ford’s Theater on February 11. DC’s leading movers and shakers were on hand, most notably President Obama and House Speaker Nancy Pelosi. And although Lucas actually isn’t Pelosi’s constituent — Nancy Pelosi is the representative of California’s 8th Congressional District, while Skywalker Ranch is in the 6th — what savvy Bay Area politician would let a few squiggly lines on a map keep her from basking in the limelight of a local Democratic celebrity? After violinist Joshua Bell performed early in the program, it was revealed to the crowd that the instrument he used during “My Lord, What a Morning” was last played at Ford’s on April 14, 1865 — the night of Lincoln’s assassination. The violin was part of the orchestra that night, Ford’s officials said, and was donated in 1991 by the family of its original owner to the National Park Service, which has jurisdiction over the historic theater. Two former Hillary Clinton staffers started Vote Both.com after the primaries, a site advocating a unity ticket of Clinton and Obama. Key backers of the “dream ticket” include Sen. Dianne Feinstein of California, Pennsylvania Gov. Ed Rendell and Sen. Charles Schumer of New York. I mention this because Westercon begins this week in Las Vegas, one of the rare conventions that changes sites each year as voted by the members, and I’m reminded that somebody once had the bright idea that “Both” would be the perfect solution for a pair of Westercon bids. Let me tell you how well “Both” worked for us. Then you may consider yourselves warned. After a weekend of people running about asking each other whether they voted for “Both,” the bidders agreed to count the ballots after Site Selection closed 7 PM Sunday, and not release the results until the next morning’s Business Meeting. Randy Rau (Phoenix), Craig Miller, Ben Yalow, Pam Davis (Portland) and Bryce Walden (Portland) were the counters. After the counting session, Rau, who was also chair of the ’82 Westercon and therefore custodian of the ballots, walked from the room down the fire stairs to the con level (the most efficient way of getting around, given the elevators). By the time he got to the bottom, somebody came up to him with a rumor that a bid had won by one vote. “Bullets, not ballots,” suggested Seth Breidbart. After extended private huddling between the bidders and parliamentarian Fred Patten, a decision finally came forth. Rather than risk having to let the meeting vote whether to reopen balloting (which it easily would have done, considering the pack of irate Phoenix fen), Randy Rau announced that the Phoenix bid withdrew. Portland was proclaimed winner. Chairman of the meeting, Bruce Dane, revealed 374 votes were cast; now being rushed to the shredder. 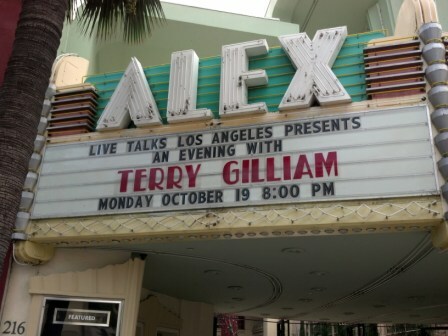 There was much applause. Westercon rules actually mandated the release of the voting info, but everybody pretended to forget that in the interests of peace. What had really happened? Milt Stevens’ analysis of the situation led him to believe that the “Both” bid had won. If Portland had won by one vote, the matter could have been resolved by merely sticking to the agreement that balloting was closed the night before. If Phoenix had won by one vote then they wouldn’t have had to pack the Business Meeting. They wouldn’t have had to withdraw their bid to resolve the crisis. (“Both” ceased to exist when one bidder folded.) Nor would there have been such haste to destroy the ballots. As she was preparing to leave the con, Genny Dazzo loudly announced that she was going back to New York and start a Phoenix in ’84 Worldcon bid, to repay the “Both” bidders for their hubris. The Moral of the Story: “Both” seemed a clever idea to just enough Westercon voters to make the election three times as controversial as it otherwise would have been, and to leave the winner just about as unhappy as the loser. The saving grace in 2008 is that party delegates are much less likely to try and force “Both” on unwilling candidates.